A picture taken on 12 February shows children gathering around their tent in the middle of Gaza City. This family, including eight children, left their apartment after the father lost his job and could no longer pay rent — another sign of the dire financial straits facing so many in Gaza. The video above shows a typical day for workers operating a mobile clinic in Iraqi Kurdistan. This week, we take you on a remarkable road trip, in a mobile clinic providing physician and pharmacy services to displaced families in Iraqi Kurdistan. Funded by CNEWA, the mobile clinic is an initiative of the Rev. Yousif Jamil Haddad, the pastor of the Virgin Mary Syriac Catholic Church in Zakho, a bustling city close to Turkey and a commercial hub for the export of oil from Kurdistan. “Many refugees are staying in poor, remote villages where they have no access to medical care,” says Father Haddad, explaining the motivations behind the project that began its operations last June. Today, the mobile clinic visits 22 villages scattered throughout the hilly northern edges of Kurdistan, serving a population of roughly 15,000 internally displaced Christian, Muslim and Yazidi families. Staffed by a doctor, a pharmacist, an administrator and a driver, the van departs from Zakho around 9 a.m., five days a week. Each morning, the van is loaded with supplies stored on the premises of the Syriac Catholic parish. It then makes its way to one or two villages where, typically, the clinic’s doctor provides medical consultation to some 140 patients. In the daily efforts of this small operation, displaced from all walks of life have found a lifeline — enabling many of the region’s most vulnerable people to reclaim health and hope. Check out the video above for an up close and personal view. It’s worth looking at how that “discussion and collaboration” came out — and how it is being carried out to this day. On Pentecost Sunday 1964, a year before the promulgation of “Nostra Ætate,” Pope Paul VI set up the Secretariat for Non-Christians whose work was “to promote mutual understanding, respect and collaboration between Catholics and the followers of other religious traditions.” In the decades since, that work has only deepened. As the Catholic Church became more sophisticated and deeply engaged in this dialogue, Pope John Paul II in 1988 restructured the Roman Curia (the central administration of the Catholic Church), creating the Pontifical Council for Interreligious Dialogue (PCID). In addition to maintaining bi-lateral dialogues with the great religious traditions of the world, the PCID encourages and promotes local dialogues. Three times a year it publishes “Pro Dialogo,” containing articles on theological topics related to inter religious dialogue; it also reports on the work of local dialogues throughout the year. This work has entailed not only words, but also concrete actions. Three popes — John Paul II, Benedict XVI and Francis — have hosted major interfaith events in Assisi. At these gatherings, religious leaders from around the world gathered to reflect on the values they hold in common and on how they might work together for a more just add peaceful world. In addition, every year the Holy See sends out greetings to members of other religions — including Hindus, on the feast of Diwali (the festival of lights) in November and Muslims on ‘Eid ul Fitr — the end of Ramadan, the Muslim holy month of fasting. Other religious traditions are included throughout the year, as well. The PCID also has a special committee for relations with Muslims. The proximity of the two faiths and their often unfortunate histories together convinced the church to pay special attention to Islam. While the Holy See maintains diplomatic relations with many different Muslim majority countries, the PCID focuses primarily on religious issues. Recently, relations between the Catholic Church and Al Azhar University, perhaps the premier Sunni Muslim university in the world, were resumed with the hope of increased cooperation between Muslim and Catholic theologians and thinkers. While the work of the PCID may seem remote to Catholics in general and also to CNEWA, nothing could be further from the truth. Catholics all over the world are increasingly encountering members of other religions. More and more, they are our neighbors. In the U.S., Europe and elsewhere mosques, Hindu mandirs (temples), Buddhist sanghas (religious communities), Sikh gurudwara (temples/centers) are becoming familiar fixtures in urban — and even rural — landscapes. CNEWA works in the Middle East and southern India. In both regions, Christians are a minority surrounded by much larger religious communities — Islam, Hinduism and Buddhism. Good relations with these faiths in imperative. Often, members of these religions benefit from programs which CNEWA maintains. Over the years the popes have stressed the importance of interreligious dialogue for the survival of the planet. The Catholic Church recognizes that centuries of interreligious conflict must be replaced by interreligious dialogue and understanding. Again and again popes have stressed that this not something added on to Catholicism but part and parcel of what it means to be Catholic. These are some of the students who attend classes at the St. Joseph’s Home for Children in Pallanad, India — a place that is Breaking the Cycle of family life scarred by alcoholism and abuse. 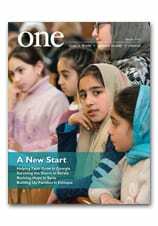 Read more about the remarkable work the school is doing in the March 2017 edition of ONE. A picture taken on 8 February 2018 shows the exterior of the Mariamite Cathedral of Damascus, one of the oldest Greek Orthodox churches in the Syrian capital, reflected on the glass pane of a window that was broken after rebel mortar bombardment that struck the eastern Bab Touma neighborhood.